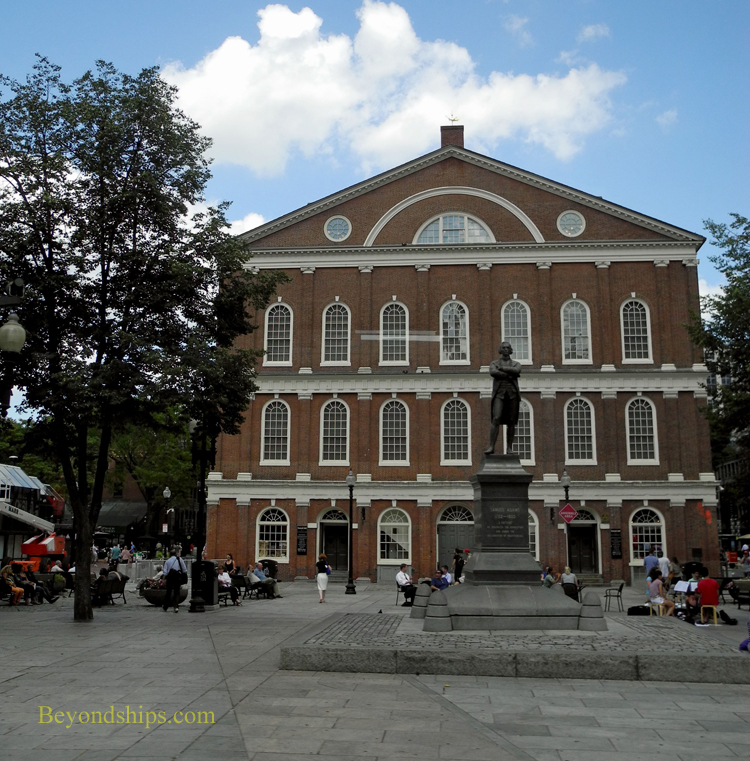 A short distance from the Old State House is Faneuil Hall. 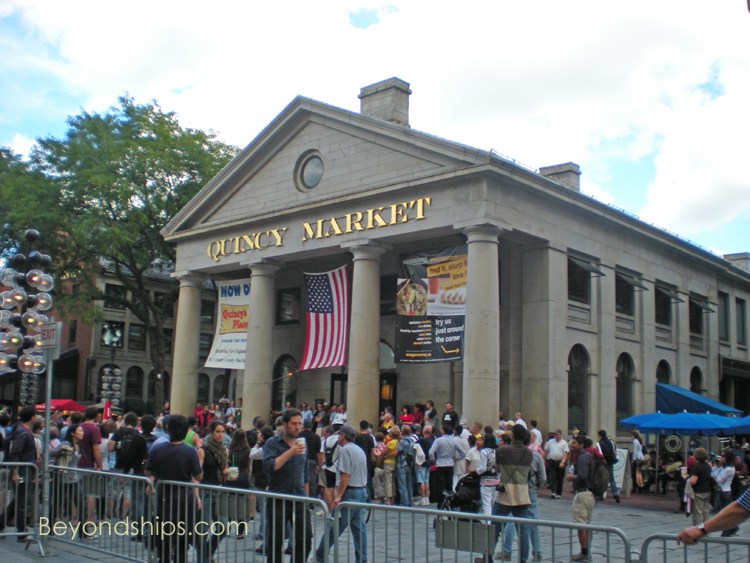 Originally constructed in 1742, using funds donated by merchant Peter Faneuil, the building was designed as both a market and a meeting place. It was expanded in 1806 by Charles Bullfinch. throughout history including speeches by Samuel Adams, William Lloyd Garrison, Susan B. Anthony, Oliver Wendell Holmes Jr., John F. Kennedy, Bill Clinton and Ted Kennedy. The building's weather vane in the shape of a grasshopper has been a symbol of Boston since the Revolution. 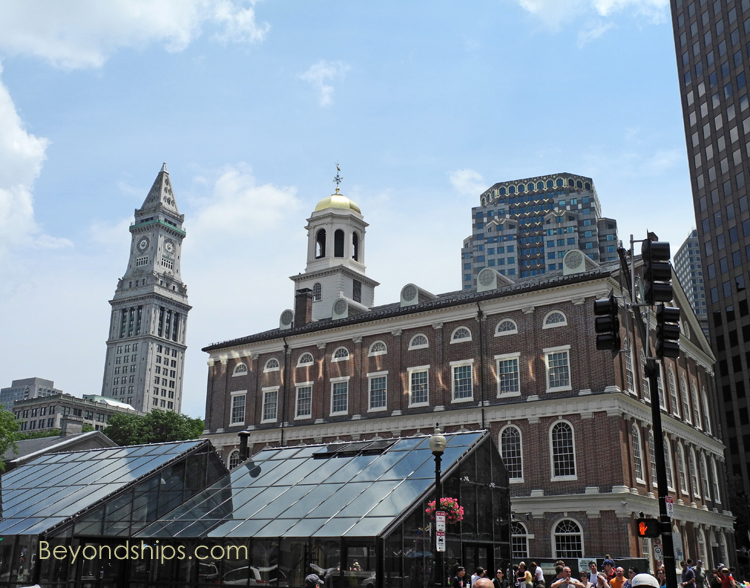 In fact, prisoners thought to be spies were interrogated by asking what is on top of Faneuil Hall. Market. Begun in 1826, the market remains a hub of activity. It includes a variety of eateries and upscale shops housed in a combination of restored and modern buildings. Street performers often charm the crowds in the market's open-air spaces. Holocaust Memorial. It is dedicated to the six million Jews who were killed by the Nazis. Six glass towers recall the six main death camps. On the glass panels are inscribed numbers reminiscent of the tattoos that the captors inflicted on their victims. Other panels have quotes from survivors. The peace and beauty of this tree-lined spot only serve to underscore the horror of the atrocities that are recalled. Nearby on Union Street is the Union Oyster House. This restaurant occupies a building that has been standing since the 17th century. 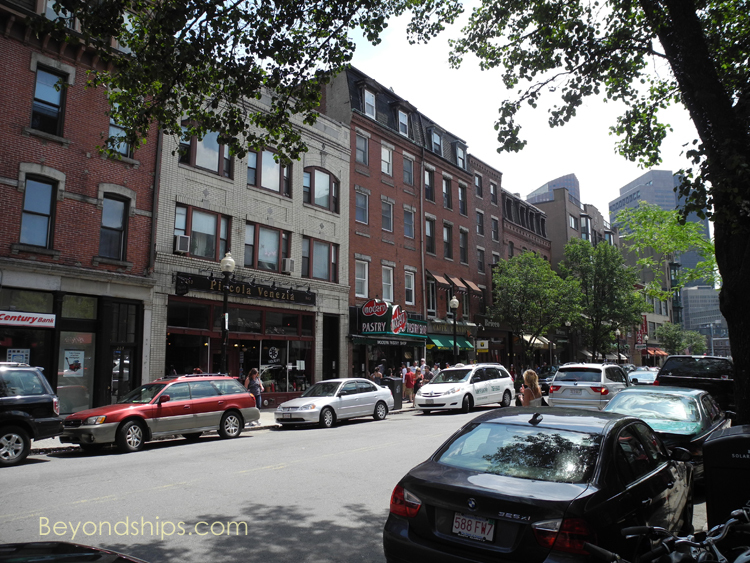 It became a restaurant in 1826 and its customers have included Daniel Webster and John F. Kennedy. 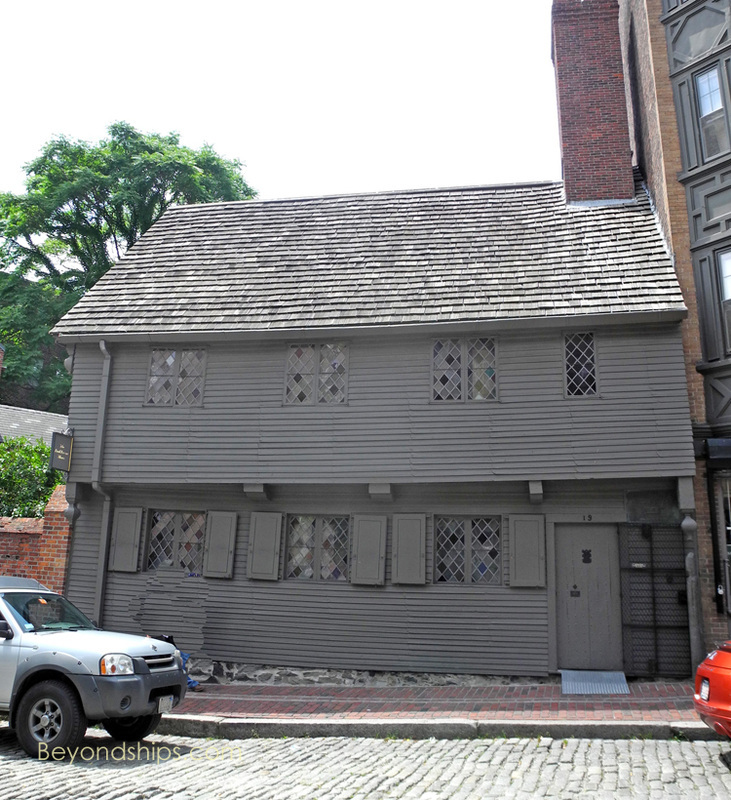 A major landmark of the North End is the Paul Revere House, built in 1680. An accomplished silversmith and engraver, Revere is best remembered for his "Midnight Ride" in 1775 to alert patriots that British troops were on the way to arrest the revolutionary leaders Samuel Adams and John Hancock and to confiscate the gunpowder that the Americans were storing at Concord. This warning enabled the American militia to assemble at Lexington and confront the British troops in the first battle of the American War for Independence. 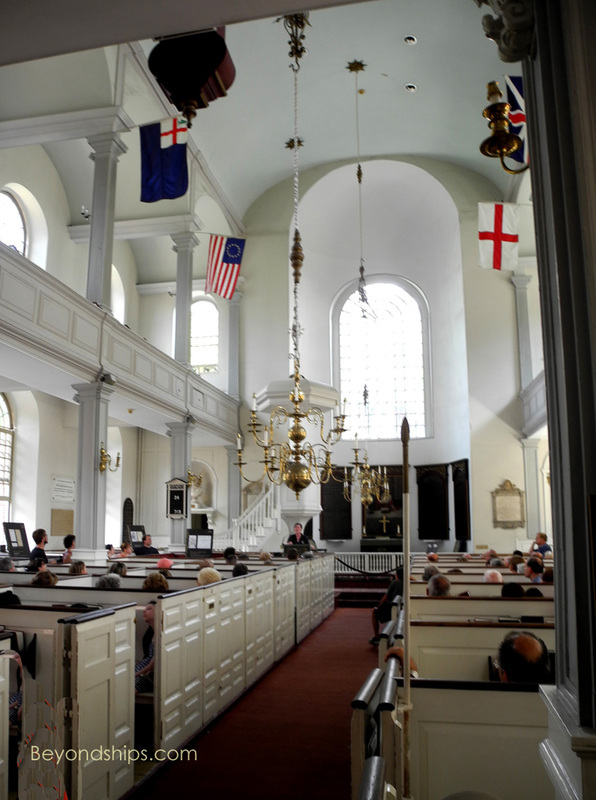 Nearby is the Old North Church, Boston's oldest church (1723). It played a significant part in the Midnight Ride. Sexton Robert Newman hung two lanterns in the steeple to signal Revere and other patriots that the British troops were going by sea rather than by land. Robert Newman is buried in the North End at the Copp's Hill Burial Ground. This was Boston's largest colonial era cemetery. Because it is located on a hill, the British used this area as an artillery position during the Battle of Bunker Hill. The Freedom Trial continues over the Charlestown Bridge. On the far side, you will find the Bunker Hill Monument and the Charlestown Navy Yard, where the USS Constitution is berthed. (See separate feature). Click here to return to page one of this feature.